Take A Favorite Photo, Add New Camera & Splash Of Sunshine. . .
Then try to decide which one you like best. I'm lovin' the sunshine, and the color is sharper, I think. Yes, but what is that tool hanging there? My favorite would be the newer one. Very sharp and bright colors. Have a great day Farmgirl! I am off to play with our newest addition. Really nice photo! What kind of camera are you using? I definitely need a new one. Ok, I'll be the voice of dissent here. Love this one, and the color is def. sharper but I think I prefer the older one, if only for the deeper shadows behind the hay. Yes, this one is better. I'm so glad I grew up on a farm. I'm with Amy. If I were a gallery owner, I'd look at the newer one as a nice snapshot, but the older one is worth matting and framing. The dark background and deeper shadows really makes that gorgeous wood the focus. I might darken the lighting on the upright, but the old one's pretty near perfect. It would be gorgeous as either sepia tone or, dang, that similar coloring with the cooler hue. I can't think of it now. Doesn't it look like something some famous photog might have done 50 years ago??? I am so glad I went ahead and put up this second photo. It was really neat to hear all of your thoughts and opinions. I'm still torn between the two, but I am leaning toward the earlier one. Something about that dark background. . . It was such a trip when I first compared them side by side. 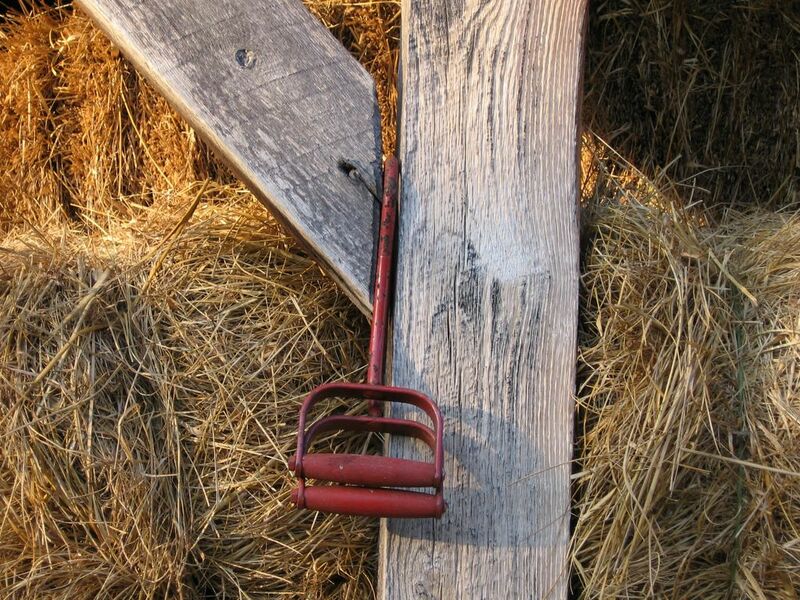 Those red things are old hay hooks, used to grab square bales of hay. Me, I just stick my fingers under the baling twine and pick them up. But before twine, bales were tied with wire, so the hay hooks were probably a better way to maneuver them around. I'm using a Canon Powershot A520. If you click on the "new camera" link in this photo caption, then click on the "my new camera" link on the page it brings you to, you'll go straight to this camera on Amazon.com. So far I am loving it. There are some quirky things going on with some pictures, but I am still learning using it on full AUTO (my kind of camera!). There are tons of manual settings and adjustments that can be made. For instance, I just learned that there is a reason my food photos are coming out with too much red in them (white plates look pink)--it has something to do with "white balance" (or something like that) and there is a way to adjust it which I hope to do soon. Anyway, I think this is a lot of camera for the price. I bought it from Amazon for well under $200, no tax, and free shipping. I wanted one that would let me start taking pictures right away on full Auto mode, and that's what I got--plus a lot more. I can tell the quality of the photos is much better than the ones I was taking with my very basic, four year old Kodak Easyshare. If you are thinking of buying a new camera, I urge you to click here. When my old camera died I put out a yelp for help and received tons of great advice, tips, and opinions from readers. The newest addition is darling! I like the older one. In the new we can see the better technology, but the old one has the better framing and the dark gives the wood and straw a really nice touch. Some detail in the wood is lost thought. But I love your photos. Welcome to the farm! And thanks for taking the time to add your opinion. I still keep leaning toward the earlier one, too. It sure is interesting hearing what everybody thinks. hmmm, I like the older one better, although I can see the purpose of the first being different -- one is about the lines of wood and tool, the other captures a context. I want a third that goes wider: show me the barn. In fact, go take a dozen different kinds of shots of it and see what you see when comparing them. I've done this a bit with cropping and it's interesting.